During LUNCH in the AUDITORIUM! Planning and preparation and PLAYING together at St. Teresa Beach. Mrs. Marshall's family has a beach house there!!! We will be announcing the Leon Theatre 2019/20 season of performances and going over all events and dates for this school year! Address: 4110 St. Teresa Ave, Sopchoppy, FL 32358 (though it isn't in Sopchoppy, but that is how Google maps recognizes it.) Once you turn off of Hwy 98 onto the sand road, you will follow the signs to the NOBLIN beach house #4110. Bring snacks and a dessert to share. Mrs. Marshall will provide hot dogs, chips, slaw, and iced tea! Carpool so that we don't have a ton of cars and parents are WELCOME!!! If you are able to give people a ride, let me know and we can set up a group meet up at Leon. It will take almost an hour to get down to the beach from Leon's parking lot. POINT SHEETS DUE for Induction in 2019! Improv Olympics will be held at Godby High School! We will take an Improv Team to compete!!! 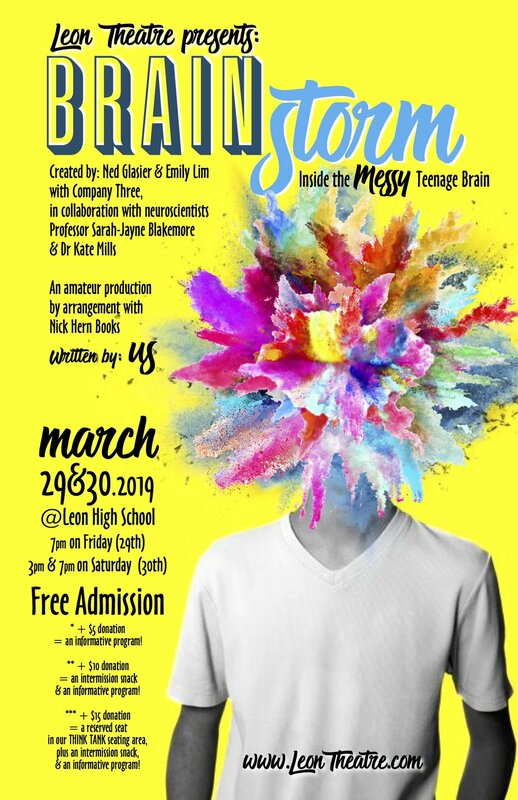 Our Leon Theatre Spring Show will be Brainstorm! It is a *devised theatre piece based on a framework highlighting the process of development of YOUR teenage brain! Auditions will run for two afternoons 3:00-5:00, MONDAY, JAN 14th and WEDNESDAY, JAN 16th. YOU MUST BE PRESENT AT BOTH AUDITIONS for Tech and Actor auditions. 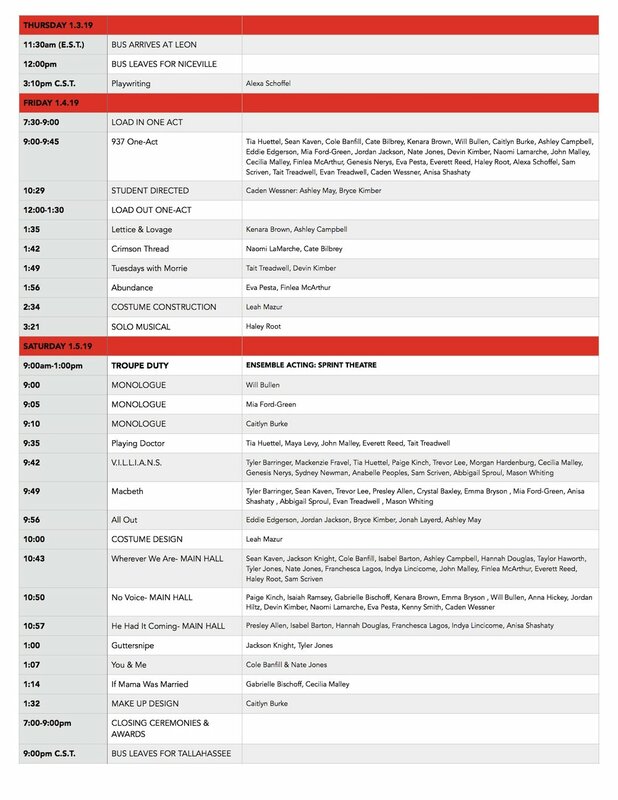 TECH positions will meet on Wednesday 3:00-4:30 with our Technical Director, Caden Wessner and be given a timeline and talk through all aspects of Tech Crew planning. We will talk more about the process of devising theatre at our first workshop! If you look at the definition of DEVISED THEATRE you will see that is vital for TECH CREW & ACTORS to work out the moments & story as we create our show!!! DEVISING will run 2 afternoons a week through January 22- February 9th. Then rehearsals will be 3-4 afternoons for actors February 12th- March 15th. The Tech calendar will be set by our Technical Director. Tech week will be March 25-29th. YOU MUST BE AVAILABLE EVERY AFTERNOON/EVENING TECH WEEK OR YOU CANNOT BE A PART OF THIS SHOW! We will not have rehearsals during Spring Break! Show dates will be MARCH 29th @ 7pm and MARCH 30th @ 3pm and 7pm. BRING your cell phone or some device that takes photos with you to the BRAINSTORM WORKSHOP on Monday, Jan. 14th and meet in the Auditorium at 3pm that afternoon! I am looking forward to creating this show will all of your brains!!! * Devised theatre - frequently called collective creation - is a method of theatre-making in which the script originates from collaborative work by a performing ensemble. The ensemble is typically made up of actors, but other categories of theatre practitioner may also be central to this process of generative collaboration, such as visual artists; indeed, in many instances, the contributions of collaborating artists may transcend professional specialization. This process is similar to that of commedia dell'arte and street theatre. It also shares some common principles with improvisational theatre; however, in devising, improvisation is typically confined to the creation process: by the time a devised piece is presented to the public, it usually has a fixed form. Sign up to audition for the spring show! TECH positions will meet on Wednesday 3:00-5:00 with our Technical Director, and be given a timeline and talk through all aspects of Tech Crew planning. DEVISING will run 2 afternoons a week (I am thinking Tuesday and Thursday) through January 22- February 9th. Then rehearsals will be 3-4 afternoons for actors February 12th- March 15th (most likely Monday, Tuesdays, & Thursdays.) The Tech calendar will be set by our Technical Director. Tech week will be March 25-29th. YOU MUST BE AVAILABLE EVERY AFTERNOON/EVENING TECH WEEK OR YOU CANNOT BE A PART OF THIS SHOW! WHEN WE ARE LEAVING: The bus will be at Leon on Thursday morning at 11:30. The bus will be leaving at 12 noon. Mrs. Kaven and I will be there around 11am to collect medicines! Bring ONE small bag to go under the bus and one smaller bag with your bus items on it. The bus ride is only 2 hours, you shouldn’t need many bus items. THE BUS WILL LEAVE AT 12 NOON. YOU MUST BE ON IT BEFORE 12 NOON. We have a FESTIVAL to get to and a Playwright that needs her adjudication time Thursday afternoon!!! LUNCH ON THURSDAY: Please have eaten lunch before you get on the bus (or bring it with you to eat on the bus), we will not eat again until dinner that evening. You will need $$ for Thursday night dinner and Friday night dinner. All other meals are provided at the Festival! MEDICATION AND ACTIVITY FORMS: Make sure I have an activity form for you (or I cannot take you) and that you have your medication stored correctly and forms filled out for each medication you need to take on the trip. If you have medication A PARENT MUST BRING THE MEDICATION to hand it (and the forms) to Mrs. Kaven before you board the bus. Even over the counter medication needs to be handed over with the proper forms filled out (Advil, etc..). Any medication found without a form will be confiscated. Carry forms only relate to Diabetic insulin, Inhalers and Epi-pens. If you want to bring meds early, rather than the day of the field trip, they can bring it to the Clinic before Friday, December 21st at noon.